Noah Brusso was born near Hanover in 1881. He took up professional boxing under the name of Tommy Burns and, although standing only 5’7” and rarely heavier than 175 pounds, was a leading heavyweight. 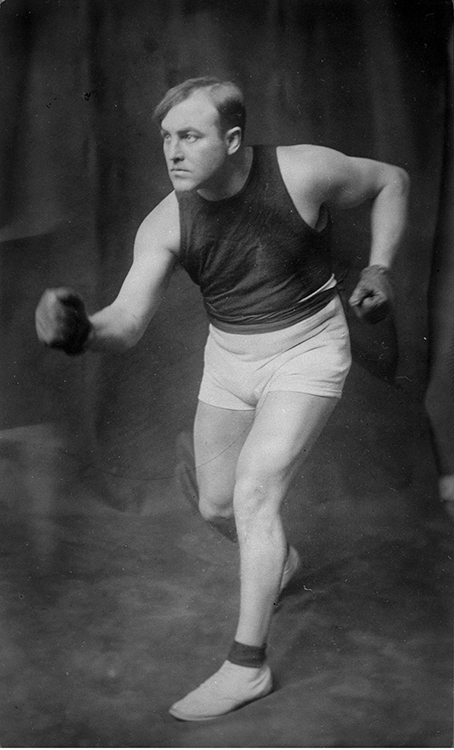 In 1906, by defeating Marvin Hart, he became the first Canadian to win the heavyweight championship of the world. Defeated by Jack Johnson in Australia in 1908, he did not retire from boxing until 1920. Brusso's methods of training were used by later athletes and he wrote a book on scientific boxing. He died in Vancouver in 1955. Visit the Ontario Heritage Trust provincial plaque in Heritage Square at Tenth Avenue and Tenth Street, Hanover, Ontario. See artifacts and photographs from the 1908 fight between Tommy Burns and Jack Johnson at the Sydney Living Museum website. Learn more about Burns on the International Boxing Hall of Fame website.